1. Because KWU attracts some of the sweetest writers out there. 2. Because I can always count on a good laugh with every link-up. 3. Because I can usually count on a good cry with every link-up. June is Blog Post by Numbers Month. Wanna play with Mel and me? Just write a “listy-type” post with a number in the title (ex. FOUR Reasons I Love Mayonnaise, SIX Things You Can Do With A Paper Clip). Then link back to us and tweet us about it so we can include you on June 30th in our final list of Great Bloggers Who Played the Blog Post by Numbers Game! And, for the love of Nabisco Triple Double Sandwich Cookies, TELL YOUR FRIENDS! 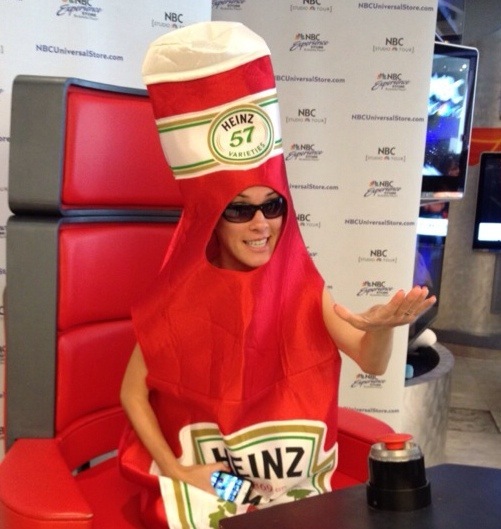 This entry was posted in Uncategorized and tagged according to mags, blog hop, ketchup with us, link up, link up an old post, mel, prompt 44, two women wearing ketchup costumes, woman wearing a ketchup costume, write for ten minutes without stopping, writing prompt. Bookmark the permalink.